Traveling is one of the most fulfilling activities in a person’s life, but despite the idealistic view that most people have, traveling can also be tiring and nerve wrecking. Some of the most unpleasant moments during one’s travels are connected to packing. Unpacking, missing or losing stuff can be incredibly annoying, especially when your travel bag does not have enough organizers. It remains a paradox how every time you pack, you try to keep everything well-organized, yet finding something in your travel bag seems impossible sometimes. The entire packing process is not particularly pleasant. However, there are ways to organize your belongings even better, by using external organizers, such as packing cubes. Why should you start using packing cubes today? If you have never heard of packing cubes before, you should know that they are simple, yet efficient organizers in the shape of cubes. They can help you pack more easily and efficiently, making travel preparations less annoying. The main advantage of packing cubes is the ability to organize objects and clothing in your bag by purpose, size, color etc. Also, packing cubes can help you find tiny objects or accessories faster and easier when you need them the most. Practically, what these seemingly insignificant accessories do is change the way you pack. If you are wondering whether or not they are worth the investment, think about all the stress that you must face every single time you are in a hurry and you cannot find your favorite top, toothbrush, beauty products or accessories. Experience has taught us that packing cubes were long missed on the market and now that they are here, we are glad that our option list has grown, which is why we have chosen to review the 5 best-selling products on the market. You are looking to buy some efficient packing cubes but you are not sure which ones are suitable for your needs or how much you should pay for them? Then you have come to the right place. What to look for in the best packing cubes? These are the main factors that could influence your decision of buying or skipping a set of packing cubes. Depending on the manufacturer, there could be others, such as the existence of a laundry bag. You are curious about the advantages of a packing cube? Take a look at the 5 products below, analyze their pros and cons and choose the best option for your needs. This set of packing cubes comes with practically everything that one could wish from such a product. It has a good price, it is made durable materials that are water repellent and zipper closure. The set includes 4 cubes with the following sizes: extra-large -17.5" x 12.75" x 4", large - 13.75" x 12.75" x 4", medium 13.75” x 9.75” x 4” and small 11" x 6.75" x 4". All cubes have a practical design and double stitching that makes them even more durable. They are made of nylon, a material that can protect your belongings from tears during traveling. 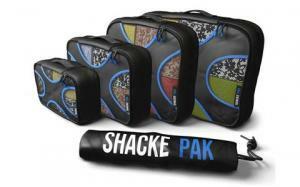 These 4 packing cubes from Shacke Pak are 4 inches deep, which makes them quite spacious. More than that, the set includes a laundry bag that is meant to help you store dirty clothes. If you decide to buy this model, you can choose from several color options such as sky blue, intense blue, black, red, green or gray. 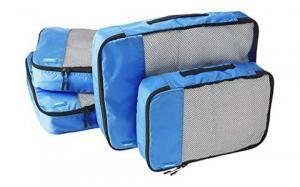 Another affordable and convenient set of packing cubes comes from Bagail. It comes in a variety of colors, such as black, light blue, dark blue, pink, green, purple, orange, intense purple and red, so the entire family can use them. This set includes 4 cubes that make the entire packing process so much easier, as you can simply organize your stuff in there and fit them into your travel bags, avoiding the regular packing chaos. The cubes are made of nylon and have YKK zippers. The top panels help users identify easily and quickly the contents inside the cubes, which makes them practical and comfortable to use when in a hurry. They are ideal for long-term trips, as the set includes various sizes: the extra-large cube measures 17.5" x 12.75" x 4", the large one 13.75" x 12.75" x 4", the medium one 13.75” x 9.75” x 4” and the small one measures 11" x 6.75" x 4". Just like the previous model, it comes with a laundry bag that is extremely practical. If you want to buy a set of packing cubes that is extremely affordable and includes more accessories than other similar products, then this product is what you are looking for. The set includes 7 packing cubes, by comparison to the previously described products, out of which there are 3 packing cubes, 3 laundry pouches and a shoe bag. 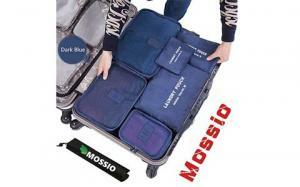 The cubes are made of nylon and are water resistant, which makes them ideal for any type of travel. They are spacious and the material seems durable, yet the zipper closure seems a little bit cheap. The 3 packing cubes come in different sizes. The large one measures 15.7" x 11.8" x 4.7", the medium one 11.8" x 11" x 4.7" and the small one 11.8" x 7.9" x 4.7". They are lightweight, foldable and can be easily cleaned. The fact that this set comes with more than one laundry bag is more practical, as you might want to separate dirty clothing and shoes. Also, the shoe bag helps you keep everything organized. This is a very popular product, giving the fact that it is one of the Amazon Basics series. It is one of the cheapest set of packing cubes on our list, it comes with 2 medium sized cubes and two large ones that are made of polyester and have zipper closure. These are basic products that can be extremely useful during your travels, yet they are not as resistant as other similar sets. They are not made entirely of nylon, having mesh parts that are not spill or water proof. However, the mesh part makes it easier for users to identify the contents of their bags. One of the advantages of these packing cubes is the double zipper closure that makes closing and opening them much easier. The medium cubes measure 13.75 x 9.75 x 3 inches and the large ones measure 17.5 x 12.75 x 3.25 inches. They can be al easily washed, as they are washing machine compatible, yet you have to choose a gentle program if you don’t want to tear them apart. They dry easily thanks to the synthetic materials, so you can rest assured that your belongings will not get wet. 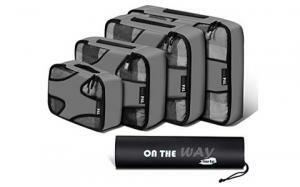 This set of packing cubes from Tour Pal is probably one of the most exciting product on this list, as it comes at a great price, it has a gorgeous design and it is made of high quality materials. It is made of Techlite diamond nylon that is durable, thick and water repellent, it has a strong zipper closure and interior lining that makes it comfortable to use, comparing to other similar products. 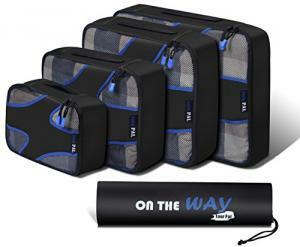 The set includes four packing cubes that are lightweight, washable and dust resistant. You can choose from colors like sky blue, black, red, gray, green or intense blue. The lid of the four cubes has a beautiful design that includes mesh material and that is meant to prevent over loading. Except for the four cubes, this set also includes a laundry bag that is made of high quality materials. They come in different sizes, from extra-large to small: the extra-large measures 16.73" x 12.4" x 3.78", the large one measures 13.58" x 12.4" x 3.78", the medium one measures 13.58" x 9.45" x 3.86” and the small one 11" x 6.69" x 4.13". How do packing cubes help you organize your stuff? Packing has always been a challenge for every single person who travels frequently and tries to fit in more stuff than the luggage can take. A simple Google search is enough to prove that people have been trying to find all kinds of strategies and methods in order to pack more efficiently. Some of them have found folding solutions that help organize the clothes and save space, while others use accessories that make packing faster. A practical option that everyone started using only a few years back are the packing cubes. Their name is very suggestive and as you saw in the reviewed list of products above, it comes from the shape of these organizers. They are cubes made of durable fabric, with a number of compartments and dividers that vary from product to product. They are extremely easy to use and have a feature that everyone loves; they are made of breathable materials, so your clothes will not be suffocated inside the luggage and will not have that awkward smell that they get in lack of oxygen. They make organizing and packing much more efficient. Also, models that come with transparent or mesh exterior offers you just enough visibility to be able to figure out what’s inside each cube and find your stuff quickly. Are packing cubes really practical? Yes, packing cubes are truly practical. You can use them for lingerie packing, for small objects, as well as for clothes and shoes. They maintain shoes and clothes fresh and at the same time, some models are capable of isolating unpleasant odors. These are important aspects, but the most appealing factor is space. When using this type of organizers, the way you pack changes completely; it becomes easier and less unpleasant. There’s more to it: packing cubes prevent overpacking, so you will eliminate the stress than comes with overweight. Sometimes, when weighing your luggage at the airport, you have to pay extra fees if it exceeds the airline limit. Are packing cubes easy to clean? This is one of the advantages that packing cubes offer. Placing all of your belongings in these organizers reduces the stress that comes with unpacking when an incident takes place and all your luggage gets dirty. If you’re planning a trip of at least one week and you will be taking with you a lot of clothes, as well as body and face products, you probably have to be more cautious, as accidents happen all the time. When using packing cubes, at least you know that they are extremely easy to clean. You can put them in the washing machine and reuse them as many times as necessary. Some models are made of waterproof materials that don’t even need to be washed thoroughly. They can be simply cleaned with a damp cloth. Thanks to the fabric that they are made of, they dry really easily and you can reuse them right away. Packing cubes are practical, easy to use accessories that can turn the packing process into a more pleasant one, especially when you own some that are made of high-quality materials and have a practical design. They are more practical and easy to use than vacuum bags or other packing accessories, which is why they are worth such a modest investment. Try packing your clothing, beauty products and accessories using packing cubes once and you will never want to get back to the traditional methods. Your luggage will be better organized, you will feel more comfortable looking for your personal belongings and more importantly, you will feel better during airport controls.